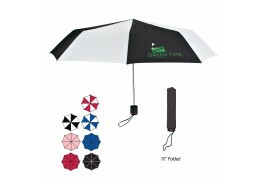 48" Auto Open Umbrella - 16 Colors ! Custom umbrellas are a wonderful way to advertise your business, and with a personalized folding umbrella, recipients can keep it in their purse, briefcase, or car so it’s always handy. Customized folding umbrellas create many opportunities for your organization, and each time it’s opened, everyone in the vicinity will see details about your business with your company logo right on the fabric. 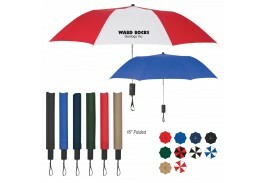 At the Custom Umbrella store, we have a great selection of promotional folding umbrellas in a large variety of styles and colors so you can find the perfect one to match or complement your company logo or graphics. Personalized imprinted folding umbrellas can be used in a variety of ways, including employee incentives, promotional giveaways, and client gifts. 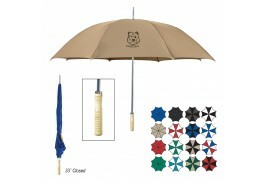 Our logo folding umbrellas start as low as $4.30 to accommodate every budget. 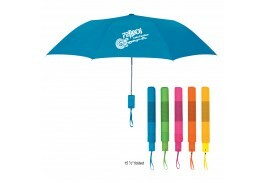 The best way to promo folding umbrellas is to buy in bulk, because the more you buyer, the lower the price. 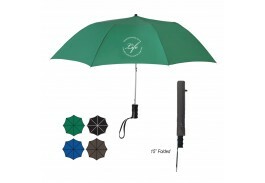 When you have a folding umbrella with a logo, customers and employees alike will appreciate your thoughtfulness of such a useful and convenient gift. Place your order online today!